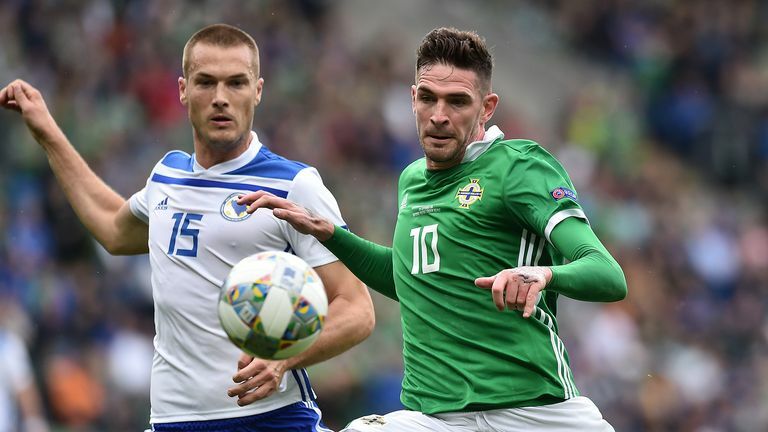 Dermot Gallagher is back with a special international edition of Ref Watch, and believes England were unlucky against Spain. 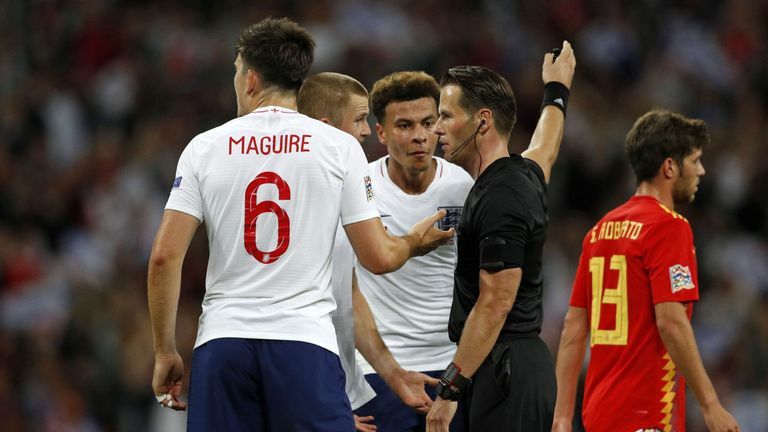 England were denied a late leveller in their UEFA Nations League opener against Spain at Wembley on Saturday, while Wales feel they were hard done by as Ethan Ampadu was penalised for a handball inside the area. Incident: Danny Welbeck's stoppage-time leveller is ruled out for a foul on David De Gea; the Spain goalkeeper fell down on top of Welbeck as he came down from collecting the ball. Dermot's verdict: "I think the guy behind the goal has disallowed it; I think he thinks De Gea was pushed, and that Welbeck leans into the goalkeeper. "I think it's really harsh. I think he's entitled to go and De Gea gets the ball. But the expectation when you see a goalkeeper go down like that is: 'Free-kick to the goalkeeper'. I thought it was a good goal." Incident: John Stones is booked for a last-gasp tackle on Iago Aspas. Stones gets some of the ball, was the last man, but the referee Danny Makkelie only gives a yellow. Dermot's verdict: "I think if you're going to make a mistake, like the referee has done here, it's the best mistake to make. It's not a foul, definitely not a foul, and he gives him a yellow card. That's wrong too: if it's a foul, it's a red card too. If you're going to make a mistake, at least he's watered it down with a yellow." Incident: Wales' Ethan Ampadu is penalised for a handball in the box as he blocks a cross. Christian Eriksen scores from the spot. Dermot's verdict: "In the World Cup you saw penalty after penalty given when the player puts his hand out. I just think it has progressed from there; I think the international refs have this notion that if you put your arm out, they're going to give a penalty. In terms of distance away from the cross, it's about the speed of the ball." Incident: Referee Pavel Kralovec didn't give a penalty for Ervin Zukanovic's challenge on George Saville. Dermot's verdict: "No, I think he goes down too easily. I'm not even sure he's touched. I think Saville kicks his leg out."